NEW YORK (AP) — If the Knicks are supposed to be tanking, someone forgot to tell their back-ups. 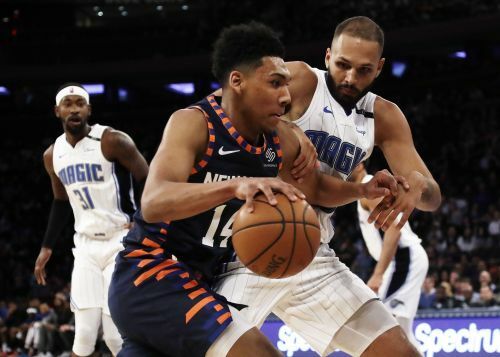 Emmanuel Mudiay, Mitchell Robinson and the rest of the New York Knicks who came off the bench outscored the Orlando Magic's reserves by a whopping 75-7 in a 108-103 win on Tuesday night at Madison Square Garden. Mudiay finished with 19 points and Robinson added 17 points, 14 rebounds, six blocks, and three steals to help the Knicks win their second straight game at home after they dropped 18 in a row at MSG. Robinson joined Ralph Sampson (1984) and David Robinson (1989) as the only rookies to post those numbers in a game since blocks became an official stat in 1973-73. "He's making history right now," said Knicks Coach David Fizdale. "Every single day he continues to grow and get better. His impact on the defensive end is special. The guy is blocking jumpers. He's guarding guards." The Knicks never led in the game until Robinson's free throw with 2:57 remaining put New York in front 101-100. Henry Ellison followed with a 3-pointer and Mudiay hit two free throws with 33 seconds left. Ellison, who is on a 10-day contract and was only appearing in his second game with the Knicks, played 36 minutes off the bench and finished with 13 points, nine rebounds and five assists. "Coach Fiz left me in there for a while," Ellison said. "I looked back a couple of times because I didn't expect it. He just gave me an opportunity to go out there and play. It was a lot of fun. I couldn't tell you the last time I played 36 minutes." Terrence Ross' 3-pointer with 28 second remaining brought the Magic within three. Allonzo Trier, another back-up, then hit two free throws five seconds later for the final margin. He finished with 18 points. "Coach is doing what he does with the lineup based on how he feels during the game and he had the whole bench together and it worked tonight," Trier explained. Nikola Vucevic and Aaron Gordon each scored 26 points for the Magic, who held a 16-point lead in the second quarter. They were still up 90-78 entering the fourth. New York outscored Orlando 11-1 to open the final quarter and eventually pulled even on Robinson's alley-oop dunk from Trier with four minutes left. The Knicks have now won three of four after losing 18 straight games. "They play with nothing to lose," Gordon said. "When they get confidence and start making shots, they feel like they can play with anybody so that's what they did." Jonathan Isaac scored 16 points and Evan Fournier added 15 for the Magic, who had won six of their previous seven games. Magic: Markelle Fultz, the top pick of the 2017 NBA Draft, was traded by Philadelphia to Orlando on Feb. 7. He played in 19 games for the 76ers, but is suffering from thoracic outlet syndrome and has yet to take the floor for the Magic. Knicks: DeAndre Jordan, who leads the Knicks in rebounding (12.4 rpg in his five games with the team), missed his second straight game with a sprained left ankle. . Frank Ntilikina has missed 13 consecutive games with a groin injury. A Magic victory on Tuesday would have put them into eighth place and the final playoff spot in the Eastern Conference by a percentage point over the Charlotte Hornets. Orlando hasn't made the playoffs since the strike-shortened 2011-12 season (37-29), the last of six straight playoff appearances. Only one player from each team has played in every game this season. Ross has seen action in all 62 games for the Magic and Noah Vonleh is the only Knick to have played in all 61 of their games. Vonleh has started 50 times, while Ross has never been on the floor for tipoff. Magic: Orlando hosts Golden State on Thursday. Knicks: New York hosts Cleveland on Thursday.